When I am meal planning, I often like to make things that are similar right next to each other to ensure that I use all of the ingredients and that there are no leftover components sitting in the fridge forever. While I was thinking about the buffalo wing dip , it reminded me something else that I have been wanting to try making for a while, a bbq chicken pizza. A bbq chicken pizza is basically a pizza with barbecue sauce instead of a tomato sauce that is topped with grilled chicken, onions and cheese. I have experimented with replacing the tomato sauce on pizzas before and I have alway been happy with the results so I was looking forward to trying a bbq sauce based pizza. At one point, I was thinking about just using hot sauce but I figured that a homemade bbq sauce would be even better and I had just picked up some liquid smoke that I wanted to try adding to give it a hickory smoke aroma. The bbq chicken pizza turned out really well! The sweet and spicy hot bbq sauce was simply amazing as a pizza sauce all covered in melted cheese and the smoky aroma took it over the edge. 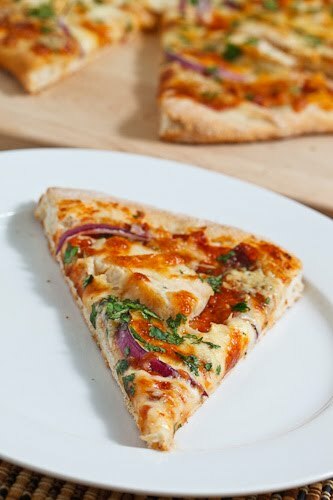 Barbecue chicken is always good and the combination was definitely a winner on this pizza. Now I am looking forward to having the leftovers for breakfast. Grill the chicken until just cooked all the way through, remove from heat, let sit and then slice it into 1/4 inch slices. Roll the pizza dough out on a lightly floured surface. Spread the bbq sauce over the dough followed by the chicken, onion, and cheeses. That pizza looks perfect! Mine always look deformed. Barbecue sauce on a pizza is a nice twist on tradition. Love it! YUM! This pizza looks so tempting. Hey, Kev, How about some of your former heart-weight-well-being-healthy recipes? Like all of your shrimp, etc ????? I had a Thai Chicken pizza just the other night, I think it is time for a BBQ chicken one soon!!! A gorgeous pizza! Nice combo! California Pizza Kitchen (a chain restaurant here) has a bbq chicken pizza that I love…but I bet yours would beat it. hands down. Good looking pizza Kevin, full of delicious flavours and very colourful! I am a BBQ Chicken Pizza fan and this looks awesome! Ha – saw the title & thought of pizza on the BBQ. Someday soon…. A classic pizza! Tangy bbq with blue cheese? Great. Great looking pizza! I think some diced smoked, salty ham and sweet pineapple chunks would make nice additions as well…yum!! This is absolutely a very delicious pizza. I love the flavor. Perfect. This is on my menu for this week, do you think I could use the thin pizza crust for it? Or should I stick with the basic one. Carmelizing the onions and cooking the chicken in BBQ sauce takes this to the next level!